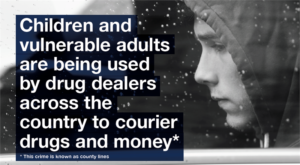 Safeguarding children and young people to the age of 25 from sexual AND criminal exploitation is a key priority for Safer Cornwall, the Safeguarding Children Partnership, and Safeguarding Adults Board. Child Sexual Exploitation (CSE) is a form of sexual abuse that involves the manipulation and/or coercion of young people into sexual activity – March 18 2019, is National Child Sexual Exploitation Awareness Day which aims to highlight the issues surrounding Child Sexual Exploitation and encourage everyone to think, spot and speak out against abuse – we are also widening the scope to think about criminal exploitation, county lines, trafficking and modern slavery. We want to raise awareness of child exploitation: knowing the signs, how to report it, and where to get help. We will be part of a social media campaign in the days leading up to and including the 18th March 2019 – you can sign up to the National Working Group on Twitter https://twitter.com/NatWorGroup or Facebook https://en-gb.facebook.com/TheNWGNetwork/ or visit their website http://www.stop-cse.org/ and look out for our local social media campaign! There’s no quality control with illegal drugs. You can never be sure what’s in a pill or powder– even if someone tells you what’s in it, they might be wrong – and you don’t know how you will react to a particular drug or particular dose. Everyone is different and drugs can affect people in different ways. Some pills are more powerful than others and could make you seriously ill, and some are lethal as Shakira’s tragic death shows. If you have decided you are going to take a drug, try a small amount of it first and wait at least an hour to see what the effect is before considering taking any more. Some drugs, including those commonly found in ecstasy, have a delayed effect, so you run an even greater risk of overdose if you top up too soon because it doesn’t yet seem to be working. 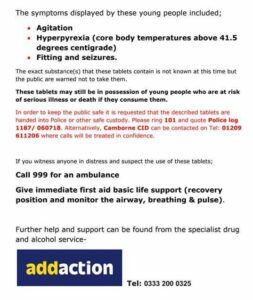 The risk of overdose is much higher when substances are mixed with other drugs or alcohol. Don’t take multiple substances or mix with alcohol at the same time. If you’ve taken something and start to feel unwell, take time out to look after yourself and ask for help if you need it. If the problem doesn’t improve or is getting worse, you should seek medical help. You won’t be reported to the police. Drugs can be dangerous. But does banning them cause more harm than good? Come along to learn about the impact of drugs on Devon and how we can better protect our community. 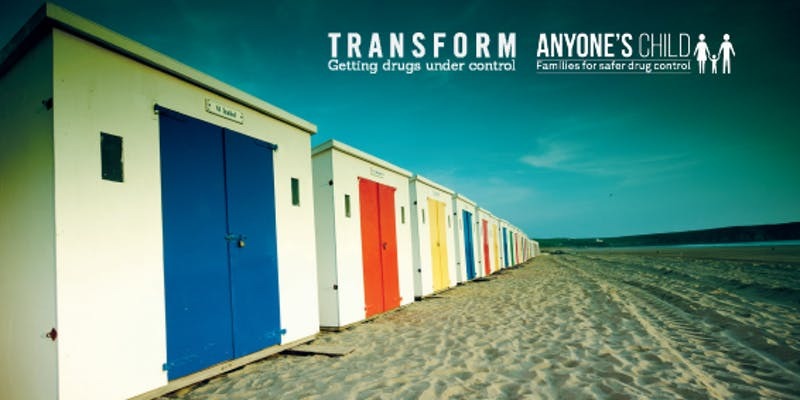 Join the discussion about what a new approach to drugs could mean for Devon, your family and your community. 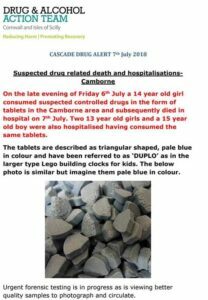 Esther Campbell – Esther’s brother Luke died from an accidental ecstasy overdose. She is currently studying at the University of Bristol and is a member of the Anyone’s Child campaign. Esther wants the legal regulation of drug production and distribution to reduce the harm they pose. Suzanne Sharkey – Vice chair for LEAP UK (Law Enforcement Action Partnership). 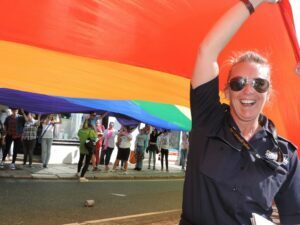 Suzanne worked as a police officer for five years working in a specialised crime unit and undercover drugs buying operations. She is in long term recovery from problematic substance use. Danny Kushlick – Founder of Transform Drug Policy Foundation in 1996, after working widely in the drugs field. He is now an internationally recognised commentator on drug and drug policy issues. Chris Evans – Lost her son Jake to an accidental overdose. She now regularly gives talks on the subject and campaigns with Anyone’s Child for the legal control and regulation of drugs. Followed by a Question and Answer discussion. This is a free charity event, but donations will be gratefully received. 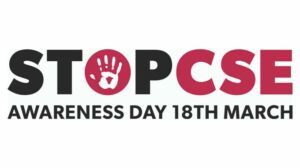 National Child Sexual Exploitation Awareness Day takes place on Sunday 18th March 2018. 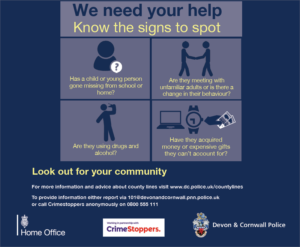 Safer Cornwall, Our Safeguarding Children’s Partnership and the Safeguarding Adults Board will be participating in the awareness campaign with a focus on grooming on-line.